Save the Duke of Uke! 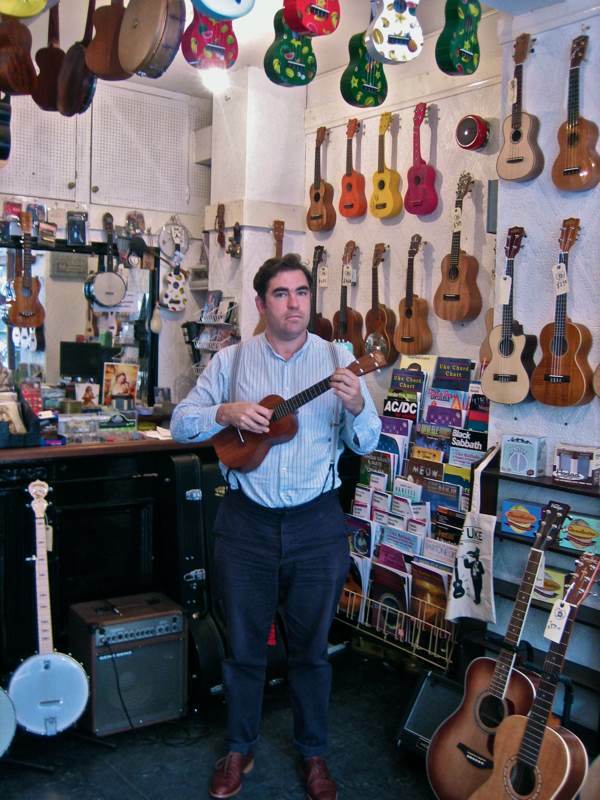 With his dark-eyed charm and dapper retro-tweeds, Matthew Reynolds is a popular character in Spitalfields, celebrated for opening Britain’s only ukelele shop The Duke of Uke and making a glorious success of it. Where once Hanbury St was a mere walk-through from Spitalfields Market to Brick Lane, in the five years since the Duke of Uke opened it became a destination, and as a result classy brands like Grenson and YMC have now opened shops there too. Yet this transformation means the Duke of Uke will have to leave, as landlord Spencer Sheridan refuses to renew the lease, taking the opportunity instead to capitalise upon this new-found fashionability by installing another business that will deliver higher returns. In fact, the lease ends next Monday 18th July and, although Matthew Reynolds has been searching all year, he has not yet found a place to go, but – as events came to crisis this week – Paul Belchak, the agent acting for the landlord, managed to secure three weeks grace until 4th August. 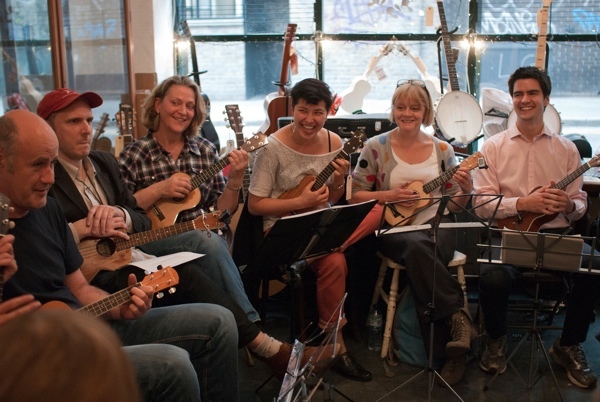 In the meantime, Fifth Anniversary Benefit Concerts are taking place this Thursday, Friday and Saturday in the crypt of Christ Church, Spitalfields, and these promise to be very special events as some top musicians gather in tribute to the Duke of Uke. Countless times, over these past years, I have walked down Hanbury St to discover excited crowds pressing their faces at the window of the Duke of Uke. 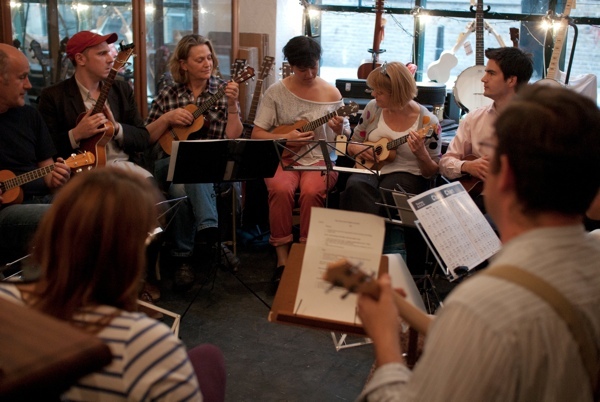 Impromptu concerts became frequent events as the ukelele revival gathered pace, as more people bought ukeleles, and more were given ukeleles as presents, and more took ukelele lessons at the shop, and more fell in love with their ukeleles, and more formed ukulele orchestras. With a recording studio in the basement and nightly ukelele classes in the shop, the Duke of Uke became the centre of a certain joyful world as umpteen passersby, like myself, were seduced by the magical twangling of strings echoing down Hanbury St.
Running his business without any investors or capital behind him, Matthew Reynolds has put his heart and soul into the Duke of Uke. An inspired teacher and a born master of ceremonies, Matthew embodies the playful magnanimous spirit of the Duke of Uke, somehow managing to sustain the beautiful endeavour and keep himself too. We all owe a debt of gratitude to Matthew and he needs our help now, because a new shop will require a significant deposit and there will be the costs of the move itself – funds which he does not have. 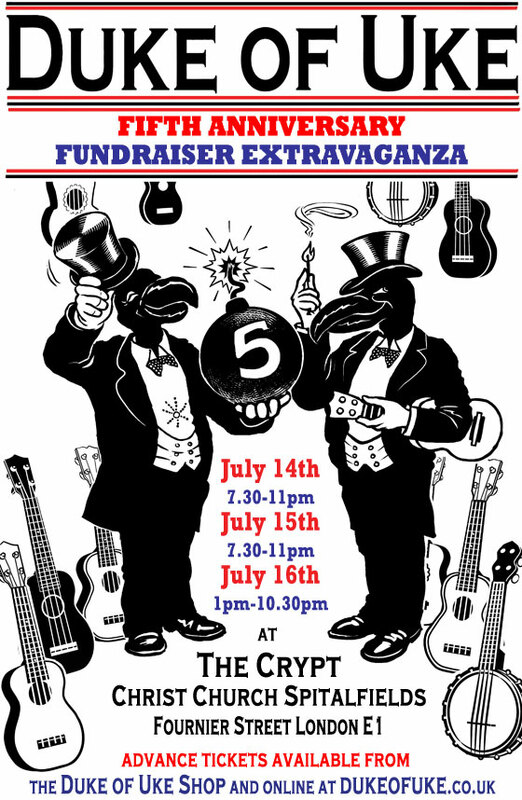 So the concerts this week are an opportunity for everyone to show their appreciation and raise money in order that the Duke of Uke may continue. 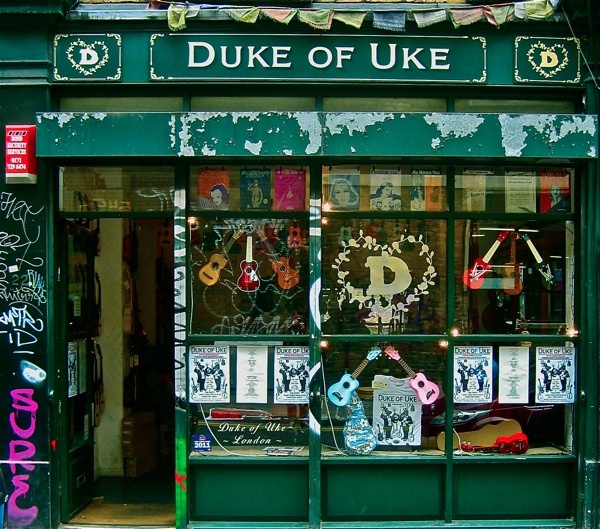 This is an important moment for Spitalfields, because the Duke of Uke is one of many small businesses that by their distinctiveness contribute to the quality and appeal of the neighbourhood. These people now find themselves challenged by landlords who are eager to maximize their incomes after many lean years. It means that independent traders need to band together to support each other and we, as the community, must support our local shops. Meanwhile, the Duke of Uke still needs to find alternative premises. When I expressed my regret to Matthew Reynolds that after five years of hard work and all the goodwill he has engendered, he should be rewarded by being pushed out – he nodded sagely and raised a smile. “The goodwill is reward enough in itself,” he said, showing grace in moment of vulnerability. Musician Eddie Vedder fell in love with the uke himself, and recently released a lovely album called Ukelele Songs. I highly recommend it. Ukeleles…in all earnestness, I love those things (I love bagpipes, too…go figure.) Unfortunately, never a one do I see in my part of the world. I certainly wish Mr. Reynolds all the best. What a blow I was planning a come up from cornwall to the venerable duke. hoped to find a grown up Uke, what do I do now? I truly hope this disaster becomes an opportunity for you. Still open for three more weeks! could the market accommodate him?